Are you looking for an Engine Diagnostics Garage? Do you have some of the common car problems below? These are some of the most common problems in vehicles. If your car is behaving strangely while you're driving, then there could be something wrong with its fuel system, engine management, cooling or ignition system. 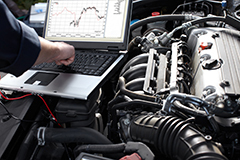 With our complete and up-to-date computerised diagnostic equipment we're confident that we can quickly identify, examine, and fix any problem with your car to get it running efficiently once again. We have specialist diagnostic tools for Jaguar, Ford, BMW, Vauxhall, Land Rover, Peugeot, Citroen, Fiat, Seat, Renault, Audi, Volkswagen and Skoda vehicles.